When I found Soapstone Werks I looked no further. Wendy helped me with slab selection and it is perfect. Greg suggested a low backsplash to meet the glass tile. This has made clean up much easier and I would highly recommend it. I also wanted a deep farm house sink. Greg showed me the piece of soapstone that was destined to be the sink. It is a show stopper with a beautiful design on the front. Everyone comments on how unique and beautiful it is. Greg is meticulous about structural support. If you take his advice you won’t go wrong. In this business being obsessive about details and quality is a wonderful thing. Soapstone Werks doesn’t just install counters, they install art. Greg and Wendy have been delightful to work with from start to finish. They worked with us to select a stone that would work well for us and allowed us to position the best sections of the stone to show it off in our kitchen. We love the soft, natural look. 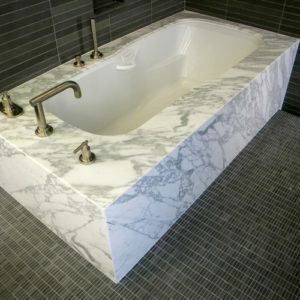 It is exactly what we were looking for and Soapstone Werks really knows their product! Our favorite thing about soapstone is the beauty of the stone. We searched the internet and found your site. You returned our call and my husband drove to Esconido from Orange County and you made the process so easy for us! From helping us pick the piece, to suggestions, to the actual installation-it was just a breeze. You gave us samples and answered all of our questions. We like the look and maintenance-just what we wanted. Thanks! Our favorite thing about soapstone is that it is beautiful and easy to care for. The installation went great and the office staff was very helpful. Soapstone clean-up is easy and we would recommend you to our family and friends! Soapstone Werks customer service was great. Good selection of stone. What most impressed me was Greg’s knowledge of the stone and his excellent craftsmanship. He went above and beyond in making sure we were happy with the completed kitchen, Fantastic! Thanks Greg. As a designer, I can’t believe I waited this long to use this material. Well, better late than never…this will be my first choice recommendation of all my projects. The product is so versatile in terms of aesthetic, it doesn’t matter whether it is a contemporary kitchen or the most traditional. I love it! The office staff were wonderful and the installation went perfect. My favorite thing about soapstone is that I love the organic look and feel with the added bonus of it being bullet proof. So far, I haven’t had any problems with soapstone and the maintenance is not as bad as I thought. I use the mineral oil when it looks a little dry and that’s it! I would absolutely recommend soapstone to my friends, and i have recommended Soapstone Werks to my friends already! Thank you for your seamless experience from start to finish. From the informative and low pressure sales experience, it is certain that you let you let your product speak for itself. Slab selection was a joy…running around with a bottle of mineral oil, bringing the pieces to life was quite fun. Your accommodation of our installation timeline requirements were above and beyond the efforts of many other companies. Installation was professional and very quick. 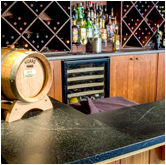 We enjoy discussing our soapstone (and its geological history) with our guests. thank you for a job well done! We felt that the office staff was wonderfully informative and helpful and the installation was one of the least stressful experiences during our construction process. Some of our favorite things about soapstone is; its natural beauty, it’s ease of maintenance, and also its temperature thresh hold. 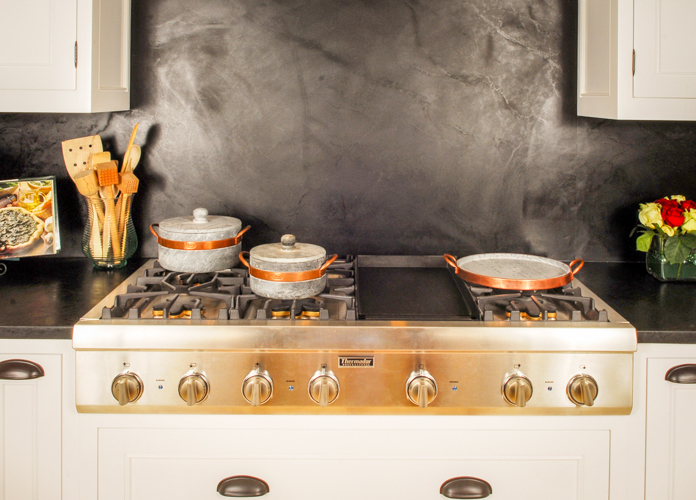 We give soapstone an A+ for maintenance and we constantly recommend soapstone to our friends. We would absolutely recommend Soapstone Werks to our friends. Simply put; we love our soapstone counters. 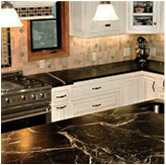 The common complaint about soapstone we has heard was how easily it scratches, we have not found that to be a problem. We oil it once a week. Every time i walk into my kitchen and see the soapstone, I fall in love all over again. It is extraordinarily beautiful, especially because of the veining. Everyone comments on it. Thank you for making it available. 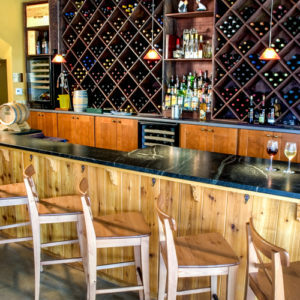 We would recommend Soapstone Werks to our friends! We love our soapstone counters and the people at Soapstone Werks made the entire process enjoyable-from picking out the perfect stone to installation. They were helpful and responsive-highly recommended! The best experience we had with installers, throughout our entire remodel process! Our favorite thing about soapstone is the way it looks and feels. The maintenance is fairly simply. Friendly, helpful and knowledgeable. They know their product and are up to front about all the maintenance, installation, cost, etc. I was pleased from beginning to end of our interaction with the company. It was worth the drive (three times) from L.A. to Escondido. The office staff was great-very helpful and welcoming. The installation was easy-they were punctual and organized. Our favorite thing about soapstone; the feel, we love it. Yes, we would recommend soapstone to our friends as long as they are willing to put in the oiling time. We would absolutely recommend soapstone Werks to our friends. Love it. I am a person who has to have the “special” stuff and soapstone is just that. Your knowledge about soapstone exceeded every stone place I went to. I was surprised at how little other sources know. 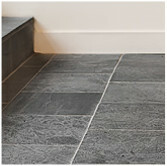 For us, the Amazon soapstone was the perfect choice-dark and very hard. Your soapstone helped make our kitchen stunning! Thank you! The whole experience from start to finish was a lesson in “how to please the customers”. The website was very informative. Being able to select the exact slabs and placement of the chosen pieces was extraordinary, under the experienced hands of the staff. And then to have it all be fitted and installed within a week was just the crowning glory. No, actually, working on and enjoying the soapstone every day in my kitchen is the crowning glory. Working on the beautiful soapstone makes me feel very elegant and cosmopolitan. Thank you for everything. We love our soapstone - it’s perfect for our 1921 Colonial home. 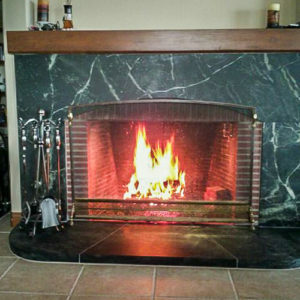 It looks beautiful in our kitchen and on our fireplaces. Many friends like the way it looks and feels, and the cooks/ bakers who visit appreciate how terrific it is as a work surface in the kitchen. It’s definitely some work up front-but we wouldn’t change a thing. Thank you for your help in getting our new home together. After doing research on the Internet, I found Soapstone Werks and was impressed by their knowledge and eagerness to educate me on their product. They were conveniently located for me to actually see the slabs, but also several samples were sent that accurately depicted the slab. Everyone I worked with was friendly and efficiently handled my order and installation - it was easy and effortless! And I love my kitchen counter-tops. The office staff was so helpful and really explained all of our options to us. The installation was smooth and seamless and quick. These guys are real experts! 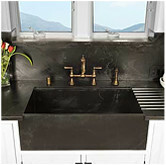 I think one of our favorite things about soapstone is that it is solid and a timeless and classic look. Love the feel of it. The maintenance and cleanup are minimal, just soap and water. I would recommend soapstone to my friends, its a wonderful material. Definitely I would recommend Soapstone Werks! As Greg and Wendy showed us around the yard, their expertise, craftsmanship and love of their trade came through loud and clear. This was an opportunity to work with master craftsmen and artisans. We didn’t pass it up! The office staff was very helpful. The installation was outstanding-everything fit perfectly. I love the natural color and easy upkeep. I would absolutely recommend soapstone and Soapstone Werks to my friends. I loved the way you educated us about soapstone and gave us all the pros and cons. You spent quality time with us to look at your stock of slabs, polishing them to reveal the color variations. I will recommend Soapstone Werks to all of our friends. The office staff was very helpful and friendly, even your young sons. Greg and the boys did a fast, clean job. We enjoyed watching Greg teach his trade. My favorite thing about the soapstone is that I’m able to set my hot pots on it. There really isn’t any soapstone cleanup, we just wipe down the counters. 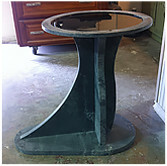 We would absolutely recommend soapstone and Soapstone Werks to our friends-we just love it and you guys were so nice! Soapstone Werks is the kind of company you want to work with. They are honest, helpful, and timely. They let you know everything up front so that there is no wondering about this or that. You are completely prepared for your purchase and install. My favorite thing about the soapstone is it’s beauty and feel. The cleanup and maintenance is so easy. The office staff was very pleasant and accommodating. The installation was quick and on time. Our soapstone island is the focal point of our new gorgeous kitchen! Lots of “oohs” and “aahs” from our friends! We would definitely recommend soapstone and Soapstone Werks to our friends. The office staff and installation was terrific. The look of the soapstone is my favorite thing. The cleanup is so easy. The maintenance is easy-just wipe it with the oil. I would recommend soapstone in a New York second. You guys are the best. You made our choice easy. The installation was unbelievably easy. Thank you! I worked with both Wendy and Greg during the process of specifying, ordering, and installing my soapstone hearth pad. I was delighted with the quick response, knowledge, and willingness to answer my specific questions. Although Soapstone Werks did not install my hearth pad, they did not abandon me during the preparation and actual installation. They provided a wood pallet to fit perfectly in the bed of my truck and secured the stone to ensure its safe transport over 250 miles. Greg also provided recommendations so that I was able to accomplish a successful and attractive installation on my own. I enjoy everything about this natural material. It nicely compliments a variety of existing stone and wood features in my log home. The color and veining are beautiful. I’ve left the material un-oiled for now to see how it darkens naturally over time. I expect it to subtly radiate heat from my wood stove this coming winter. During installation of masonry above the hearth pad, I covered the soapstone with an old rug to protect it. After removing the rug, I was able to easily vacuum, sweep, and mop the hearth pad. Wendy provided a complete scratch repair kit with my hearth pad. During installation of the actual cast iron wood burning stove and stove pipe, a ladder scratched one edge of the stone. It was so minor that I just used super fine steel wool to buff it smooth to the touch. If necessary, I can use the kit to repair more serious scratches in the future. My grandmother had a soapstone kitchen sink that my mother thoroughly enjoyed using. I’ve been able to incorporate soapstone into my living environment in various functional and decorative forms. I love its durability, soft look, and velvet feel. I would absolutely recommend it to my family and friends. The folks at Soapstone Werks met my high expectations for product quality, cost, and delivery support. The additional benefits were their incredible responsiveness, knowledge, willingness to work directly with the end customer (someone who is not a professional contractor), and ability to enjoy humor in the process. From my initial contact to picking up the completed hearth pad took less than ten days. The folks at Soapstone Werks were fabulous to work with. They quickly responded to my initial specifications with a reasonable fabrication quote. They made it easy. Greg clearly takes pride in his work and made valuable recommendations throughout the process to ensure my satisfaction, and I am more than satisfied. My hearth pad is simply beautiful, and I’m sure it’s added to the value of my home. I’m looking for other ways to incorporate this lovely stone into my daily living and working environment! When I do, I’ll be calling Soapstone Werks for their assistance. The office team was always very professional, helpful and prompt. The installation was amazing – Greg is a true craftsman, skilled in bringing out the beauty of the stone. We love the dramatic color and matte finish. We have not had the stone long enough to know about the clean-up. We would recommend soapstone to our friends, it is absolutely beautiful and unique. We would recommend Soapstone Werks to our friends because from the start to finish this was a great process that was fun and even came in under our budget! Wendy and Greg are true experts. They made the process fun, provided excellent suggestions and the end result was truly exquisite. 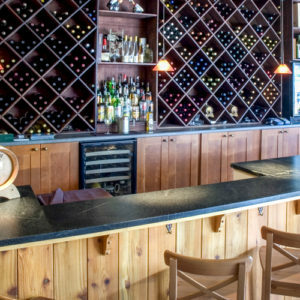 I would highly recommend Soapstone Werks to anyone who wants a unique work of art for their counter tops. We searched the Internet and found your site. You returned our call . My husband drove to Escondido from Orange County and you made the process so easy for us! From helping us pick the piece-with suggestions, to the actual installation-it was a breeze. Your office staff was very friendly, helpful, gave us samples, and answered all of our questions. The installation was no problem and the clean up was professional. We like the look, maintenance (wow)-just what we wanted-Thanks! Soapstone cleanup is easy, I just wipe it with a damp cloth. I would recommend soapstone and Soapstone Werks to my friends and already have. Thanks again! The office staff was fabulous and very professional. The installation was fabulous, on time, great workmanship, and able to handle challenging custom work. 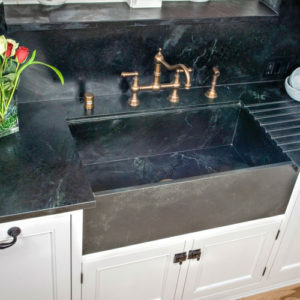 Favorite things about soapstone is the look, the finish, and the fact that it doesn’t react with red wine, tomatoes, etc. No problems with the soapstone. Maintenance is easy with the walnut oil canuba wax. Absolutely would recommend soapstone to our friends and Soapstone Werks! We love the look and durability of our new soapstone counters. The installation is perfect. We had a challenge because we have a 1914 original craftsman kitchen, and when Greg and his team replaced the old countertops, there were many custom cuts needed to fit the original cabinets, including curves and a custom backsplash. The job is perfection, the soapstone looks like it could have been original with the house. 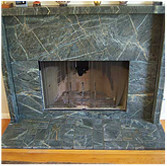 Soapstone werks also installed matching soapstone to our fireplace hearth. It’s beautiful, a perfect installation, and it looks like it is original to our 1914 home. We looked at four other soapstone companies and decided to go with Soapstone Werks because of their unique selection of soapstone, their professionalism, and their friendly attitude. Many thanks to Greg, Wendy, and their team. The office staff was excellent! Very friendly. The installation was perfect! 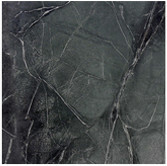 Favorite things about soapstone is the look, the feel, the bacteria resistant and heat resistant quality. No problems with the soapstone. Maintenance with soapstone is very easy. We would recommend soapstone and Soapstone Werks to our friends. 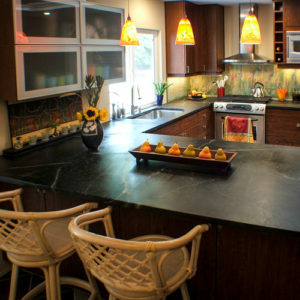 We absolutely love our soapstone countertops. The countertops are unique and beautiful. We are 100% satisfied! Office staff was a pleasure to deal with, responsive to questions, and helpful. Installation for countertops was on time and professionally done. Favorite things about soapstone is the look. Problems with the soapstone is it can be rough on glass ware if you aren’t careful, I’m learning. But the maintenance with the soapstone is minimal. We would absolutely recommend soapstone and Soapstone Werks to our friends. Working with Greg and Wendy and all the other people at Soapstone Werks was a pleasant experience, when they said they would be at our house, they were on time and helpful during the entire process. Can’t say enough good. Office staff was very friendly, helpful, and professional. Greg and sons worked diligently to install the countertop. They did a fabulous job and they look wonderful! 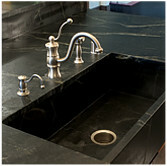 Favorite things about the soapstone is the look and soft feel of the stone. I love the non-shiny surface and the beautiful grain. There is no problems I have found with soapstone. Maintenance is very easy. After I applied the wax, just wiping with a damp is all. Absolutely would recommend soapstone to my friends. I would absolutely recommend Soapstone Werks to my friends!! This kitchen counter is our second purchase from Soapstone Werks. We previously had one installed in our bathroom. We were so happy with the bathroom that it was an easy decision to go with soapstone for the kitchen. This is a great company and I highly recommend them.